Learn to play the blues like B.B. King with my free “The Thrill Is Gone” blues guitar tab. Thank you for every note you ever played B.B. In this blues guitar tab you will learn all five minor pentatonic patterns with chords shapes in the key of B minor. These patterns are a must know allowing the guitarist to cover a wide range of the fretboard for lead playing. I have taken the intro solo from the recording and added 4 additional signature licks so you have some ideas to start with. 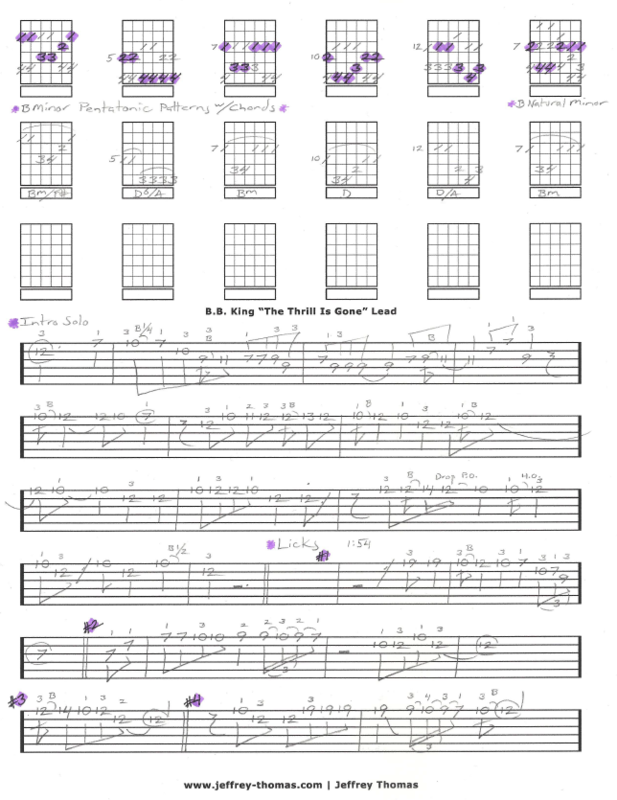 This worksheet is very popular with my blues guitar students. Want the full tab for free? Just send in your email using the form provided. Looking for blues guitar lessons? Fill out the Schedule A Free Lesson form to set up a free Skype guitar lesson with Jeff. This worksheet will help you sound great playing over this classic blues tune by B.B. King. I also have a free rhythm guitar worksheet for this tune so make sure to check my Guitar Tab Archive for more free guitar tabs.